I recently did some product reviews for my friends at Wet Paint. 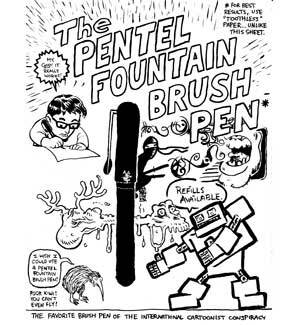 Since they are the best and the friendliest art supply store I have ever been to, and since they have generously supported the Cartoonist Conspiracy for a number of events (including most of the 24 Hour Comics Days), it was a pleasure to do it. You can read them here, if you’re interested. I was recently contacted by a representative of Toon Books, Francoise Mouly and Art Spiegelman’s recently founded kids’ comics imprint, to see if I wanted to receive copies of their latest three publications for review consideration. I don’t generally do reviews on this site, but I jumped at the chance in this case. Toon Books has seemed very interesting to me since I first heard about it for a number of reasons. I’ve always been a big fan of kids’ comics (and other childrens’ literature), and I’ve been puzzled that there seem to be so few quality comics for children produced today. The comic book industry was founded on comics aimed at children (at it’s height, the comics industry sold millions of kids’ comics every week), but today children have been largely abandoned as a market that comic publishers seek. Comics are now available in most book stores in addition to comic specialty stores, but there are few comics aimed at children in either venue. 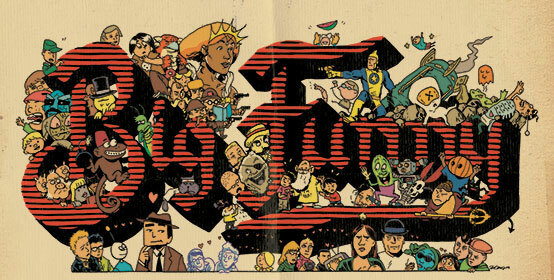 Some of the notable exceptions to this in recent years were published by Mouly and Spiegelman… the excellent Little Lit series of kid comics anthologies which featured a boatload of top notch cartoonists (Strange Stories for Strange Kids; Folklore and Fairytale Funnies; It Was a Dark and Silly Night). Spiegelman is of course best known for his brilliant autobiographical holocaust comic Maus, and Mouly and Spiegelman are the founders of the seminal art comics anthology series RAW. Few people are better positioned to pursue popularizing kids’ comics for modern audiences of children than Mouly and Spiegelman. They are exceptionally well suited for the task… they know what kids comics can be; they have a deep knowledge of comics history, and are well aware of the cartoonist giants of past kid-comic literature. Works by Crockett Johnson, Basil Wolverton and Walt Kelly were featured in the Little Lit series (if only someone would reprint all of the childrens’ work of these geniuses in books intended for children!). When I received the books the first thing I noticed is the consistent and attractive design of the series… as you would expect from the people who designed RAW. They are lovely little hardcovers with matching binding “wraps” and endpapers featuring the Little Lit mascot. There are other consistent elements tying the designs together… yellow titles with drop shadows, and word balloons and panels on the covers to emphasize that they are comics. I was excited to sit down and read them all with my three-year old daughter Esther. The first one we read was Jack in the Box by Art Spiegelman. 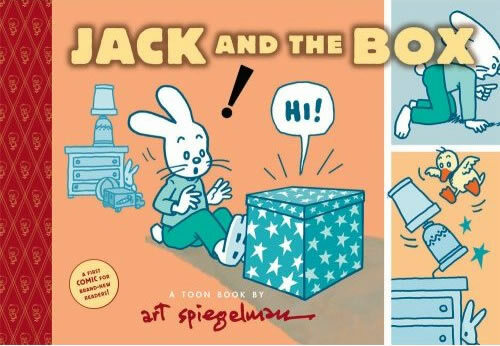 It is a simple and fun story of a boy/bunny named Jack who receives a strange jack-in-the-box from his parents. Spiegelman has aimed this book at very young readers… he is working with a very limited vocabulary (this sort of limitation can be inspiring… Green Eggs and Ham was written when Bennett Cerf bet Dr. Seuss he couldn’t write a book using only 50 different words). Spiegelman’s illustrations are typically charming and the story is funny. In the story, Jack quickly discovers his Jack in the Box is alive, bizarre, and even a little menacing. In the modern world of kids’ entertainment dominated by bland traced and retraced “characters” like Dora the Explorer and the Care Bears, whose predictable adventures never stray into anything more menacing than a rainy day, this hand-drawn book of simple and unpredictable silliness is a breath of fresh air. My daughter enjoyed it, but less so than the other two. Although she is probably more or less the age this book is aimed at, she’s been enjoying the Dark Horse Little Lulu reprints for about a year now, so it is probably the fault of her genius rather than any lack of merit of this book. 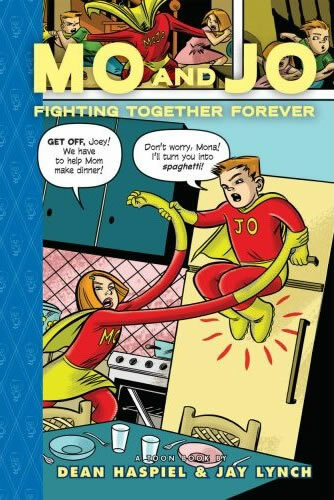 Mo and Jo Fighting Together Forever by Dean Haspiel and Jay Lynch is aimed at older kids than the other two books. It is a story about Mo and Jo, a brother and sister who fight all the time that gain superhero powers, and then learn to work together as a team. Superheroes are somewhat of a turn-off for me… I like some superhero comics, but the superhero genre has been done to death in comics… as I would guess Mouly and Spiegelman would probably agree… making this one seem like a strange fit with the rest of the kids’ books they are publishing. That all said, it is well executed (Haspiel and Lynch are both good cartoonists), and it is as much about the relationship between Mo and Jo as it is about any super powers. Obviously, superheroes are never stale to a ten year old, so my qualms about superheros are hardly relevant to the intended readership of this book. My daughter, who is much younger than the market it is presumably aimed at, claimed to like this the best of the three, so what do I know? Especially the hippo balloons… she LOVED the hippo balloons. Stinky by Eleanor Davis is probably aimed at readers somewhere in between the other two books. This one was my favorite of the three books. Eleanor Davis was the only cartoonist in the three books I was not all that familiar with (I’ve seen some of her work in the Fantagraphics anthology Mome), so I had the lowest expectations for it… and it was a wonderful surprise. Her characters are funny, endearing, and alive on the page. Her art is beautifully simple and effective… both the drawings and the coloring. Stinky is a surly swamp monster who is lonely and doesn’t know it. Like all the best childrens’ books, it is just as enjoyable to read for adults as it is for kids… which is an awfully nice thing when you know you will be reading it to your kid a hundred times. 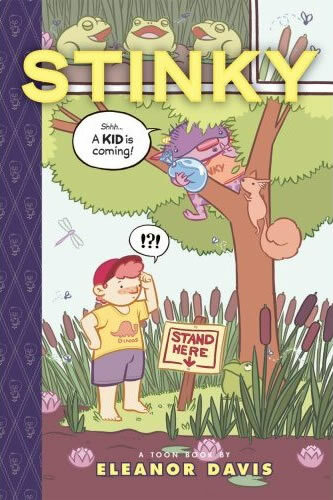 The book leaves you wanting to read Stinky’s further adventures, so I hope there will be more. Although my daughter claimed to like Mo and Jo best, this is the one she keeps asking to re-read. I hope all these books find their audience and Toon Books continues to produce comics for kids for a long time to come. If adult reading trends are any indication (comics being the fastest growing sections in book stores and libraries), some day soon I think comics will regain their proper position as the best-selling form of children’s literature. With the high quality of their comics and the talents of the roster of Little Lit cartoonists, I expect Toon Books will be at the front of the pack. 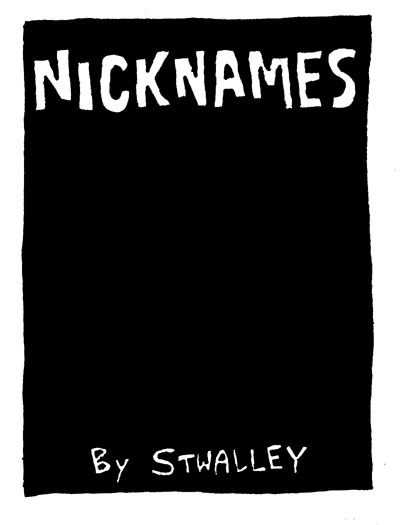 Nicknames, a mini-comic I made a few years ago, was reviewed today on Tom Spurgeon’s excellent Comics Reporter website. Tom also reviewed the Eric Lappegard Shmapples collection on the same page (which I put together with the Cartoonist Conspiracy after Eric’s death this July). Click here to read Schmapples online, and click the below image to read Nicknames online.